RARE CASE OF MULTIFOCAL EPITHELIAL HYPERPLASIA OF ORAL MUCOSA. Elitsa G. Deliverska 1 , Maria Dencheva2. Introduction: Multifocal papilloma virus epithelial hyperplasia (MPVEH) is a rare disease of the oral mucosa associated with the human papilloma viruses (HPV) 13 and 32. It occurs at any age, but children have the highest incidence. Purpose: To present a case of oral multifocal papilloma virus epithelial hyperplasia with palatal tumour and multiple metachronic primary cancers. Material and methods: The medical history shows a 60 years female patient with complaints of asymptomatic mass on the palatal mucosa, with a two years’ development. The patient has been treated surgically for previous thyroid cancer, endometrial cancer and cancer of the mammary gland. An incisional biopsy has been performed in her left buccal mucosa 10 years ago and histopathological examination confirmed the diagnosis of MPVEH. The palatal tumour was removed surgically by electroexcision and the histological result was pleomorphic adenoma of a small palatal salivary gland. Conclusion: Papillomatosis is considered as a benign neoplasm with an unpredictable course and with a low probability of malignancy.We report of an unusual case of MPVEH persistent for more than 30 years without regression and with significant impact on a patient‘s quality of life. Deliverska EG, Dencheva M. Rare case of multifocal epithelial hyperplasia of oral mucosa. J of IMAB. 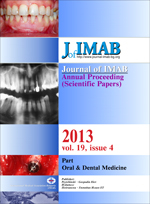 2013; 19(4):392-395. doi: 10.5272/jimab.2013194.392. 10. March CJ. Multiple papillary tumours of the labial, buccal and glossal mucous membrane. Dental Cosmos 1881;23:165. 15. Witkop CJ Jr, Niswander JD. Focal epithelial hyperplasia in Central and South American Indians and Ladinos. Oral Surg Oral Med Oral Pathol. 1965 Aug;20:213-7. [PubMed].